• My drought tolerant/deer resistant garden. 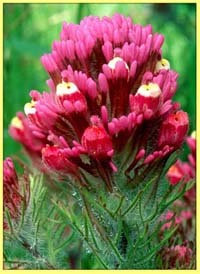 Las Pilitas Nursery has 2000 web pages of information about California native plants and their uses. Ships gallon size plants. Forestfarm is an Oregon nursery selling ornamental and useful plants from around the world, and CA natives. Theodore Payne Foundation for Wildflowers and Native Plants sells seeds of wildflowers, trees, vines, bulbs, etc. Larner Seeds has seeds and plants of CA native wildflowers, grasses, trees, shrubs. Annie's Annuals retails, wholesale, and mail order of rare, unusual annuals and perennials, and CA native plants. Easy Wildflowers wildflower seeds native to Midwest and eastern U.S.
Clyde Robin Seed Company for seeds. Wildflower Seed Company for seeds. North Coast Native Nursery for plants and restoration work. California Native Bulbs for bulbs. Telos Rare Bulbs for bulbs of CA and around the world. Sierra Seed Supply mail orders seeds, shrubs, trees. Prairie Moon Nursery for North American native plants and seeds. Cold Stream Farm for wholesale/retail bare root trees and shrubs.